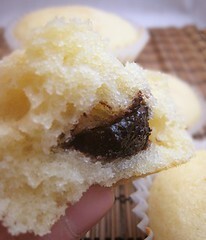 These are some yellow cupcakes that I filled with some chocolate. 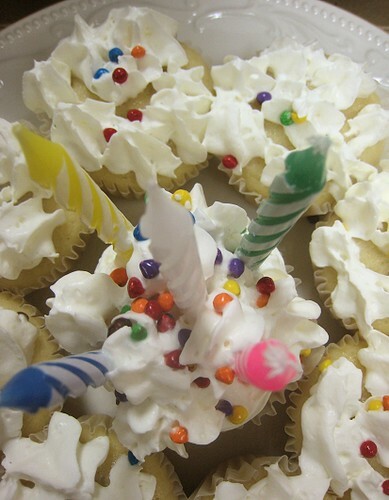 They were brought to Boss #1's class on his birthday a while back. 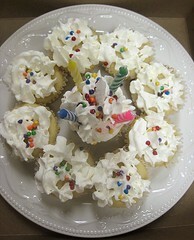 Since we're not cupcake-proficient, these were simply topped with whipped cream and some sprinkles. We would like to offer these to Dragon of Dragon's Kitchen for giving us the Kreativ Blogger award. Thanks so much! An award for creativity is truly appreciated. 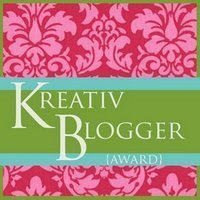 As part of receiving the Kreativ Blogger award, we have to name 6 things we love. 1) JS loves BLUE-Y, her childhood blanket. 2) ts loves fog and wind. 3) ts loves singing... so much. 4) JS has recently fallen in love with soft, Taiwanese buns... and MaLa hotpot! LOL @ ts loves to "sudden rage", for some reason it reminded me of that corny videogame for mortal kombat. Btw, the cupcakes look so pretty...a well deserved win! Great cupcakes and congrats on the well deserved award! Oh, these look great! 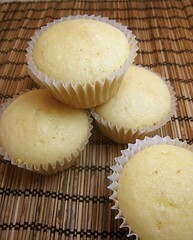 I love simple cupcakes, and the whipped cream is a nice touch!